Please ensure you have you Medicare Card with you and have your Health Care / Pension / DVA cards on hand. Patients without a Medicare Card will be charged a consultation fee (EFT available). This is payable on the day. Some medical screens such as employment or vehicle licenses will incur a fee. If your Medicare Care has expired or is soon to expire you will need to call Medicare to issue a new one. You can do this by calling 13 20 11. 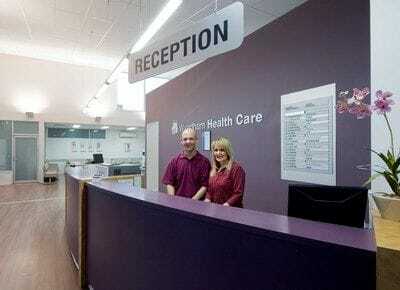 Wyndham Health Care is a walk in clinic but some doctors do make appointments for your convenience. All of our Allied Health require an appointment and may incur a fee. Please call 9749 2766 and ask reception for details. If you do make an appointment you will receive an SMS and / or phone call to confirm. Our highly motivated reception staff will endeavor to assist your needs regarding doctors rosters and Allied Health appointments. We encourage you to see the same doctor for any return visits for an ongoing condition. Our reception staff will notify the nurse on duty regarding any medical emergency presenting to the clinic.